Claremont, NH – On Friday Congresswoman Annie Kuster (NH-02) joined Senator Maggie Hassan, Claremont city officials, and TwinState MakerSpaces leadership for the grand opening of the TwinState MakerSpace in Claremont, located at the Sawtooth Building. The Space received a $250,000 grant from the Northern Border Regional Commission in 2015, which Kuster worked to support. The mission of TwinState MakerSpaces is to encourage creativity, innovation, and entrepreneurship, and to empower users with the resources to learn new crafts, explore new technologies, and put form to their ideas. The facility in Claremont, which is joining a growing number of MakerSpaces across the country, offers conventional and hi-tech tools, communal workspace, rentable studio space, training in equipment use and techniques, and events focused on the arts, manufacturing, technology, and entrepreneurship. 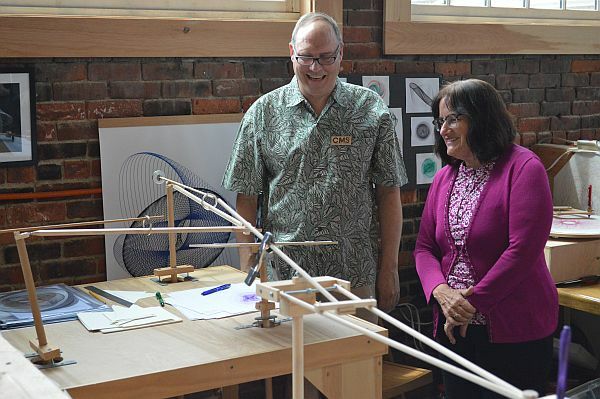 Kuster is a co-sponsor of the More MakerSpaces Act, which would put in place guidelines for how a federal agency would lease or sell an unused property to be used as a MakerSpace and communicate the potential for MakerSpaces in federal properties. This entry was posted in Uncategorized on July 7, 2018 by GrowingInArt.